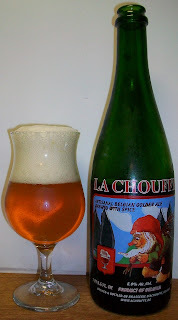 I bought this at State Line Liquors the other day to evaluate for my upcoming Belgian Bier Banquet. I have already decided to have this on draft at the banquet but I figured a full review would not hurt. The beer pours a slightly hazy golden yellow with a bright white head. This bier is highly carbonated with lots of tiny bubbles rising up from the bottom of the class. The nose is delightful with sweet light malt aromas with sweet fruit and citrus notes. Wow, I forgot how good this beer is; light sweet and refreshing with citrus and yeasty notes. The experience starts out with a light malt sweetness up front on the tip of the tongue then the most pleasant effervescence over the tongue in the middle of the sip. The back end is extremely easy drinking and refreshing with an effortless swallow. The finish is also refreshing with light malt flavors, a touch of spice, sweet citrus notes and a slight floral hop bite. There is very little of final aftertaste just a slight light malt flavor and citrus note. The alcohol is artfully masked in this beer. This beer drinks like a light refreshing 4 or 5 percent blonde not an 8 percent strong pale. Well, I’m doing more drinking that writing on this review. I’m just chilling enjoying this nice Belgian Ale. There is really not a whole lot to say about this beer. This is just a straight up solid Belgian Pale Ale. I enjoyed drinking this so much I didn’t even get out my thermometer to see how warm it was getting. It did get a little more robust as it warmed and opened up a little and the carbonation released. However it never picked up any off flavors. This beer stayed smooth and refreshing to the last warm drop. What can I say but a solid A for this enjoyable Belgian Strong Pale Ale.